Naomi Perez, Richard Perez's cousin, outside Richmond City Hall on Tuesday March 17, 2015. The Richmond Police Department's relationship with the city’s residents is under strain due to lingering mistrust around the shooting of Richard 'Pedie' Perez, a 24 year-old man killed on September 14, 2014. An investigation led by the Contra Costa County District Attorney determined in January that Officer Wallace Jensen was defending himself when he killed Perez during a struggle outside a convenience store. The officer said Perez grabbed for his gun and lunged at him. 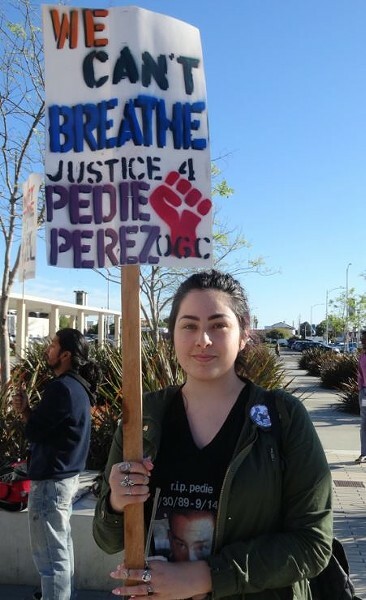 But Perez's family disputes this version of events and feels that the city has made efforts to portray Richard Perez as a troubled young man whose actions are to blame for his death, rather than investigating the officer. The family also believes the city's investigation has lacked transparency, in spite of Richmond's reputation as a progressive city with a reform-minded police department. The Perez family has retained civil rights attorney John Burris to represent them. On Tuesday afternoon, the Perez family and several dozen supporters gathered outside Richmond's City Hall to demand further investigation and greater transparency in the case. Richard Perez's mother Julie Perez said she believes that most cops in Richmond want to be transparent and accountable to the community, but that the department has lost credibility with the death of her son, and the way the investigation has been handled. In contrast to many other police agencies, the Richmond Police have been held up in recent years as an exemplary department that communicates well with the community and has implemented policies to increase transparency and trust, as well as reducing officer-involved shootings. But Rhonda Perez, Richard's aunt, said that Richmond's elected officials and some within the police department have stood in the way of justice, and that they’re risking hard won trust and support from the community. “We're not lined up against the police,” said Rhonda Perez. “It was one person who pulled the trigger. We need the good officers to stand up and do something. The Richmond Police Department did not immediately return a call about the status of the Perez case. 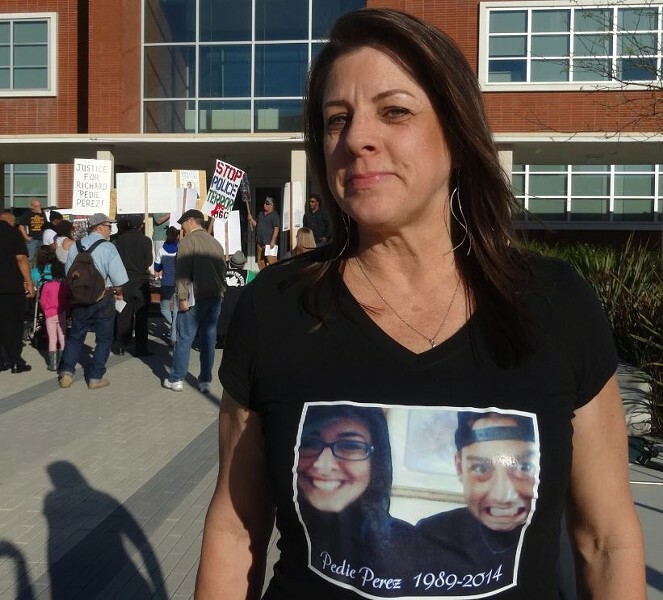 Richard Perez's aunt Rhonda Perez outside Richmond City Hall on March 17, 2015.